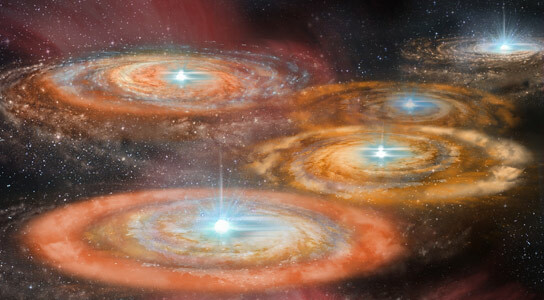 An artist’s impression of some of the first stars in the early Universe. Five protostars are seen here forming in the center of disks of gas. 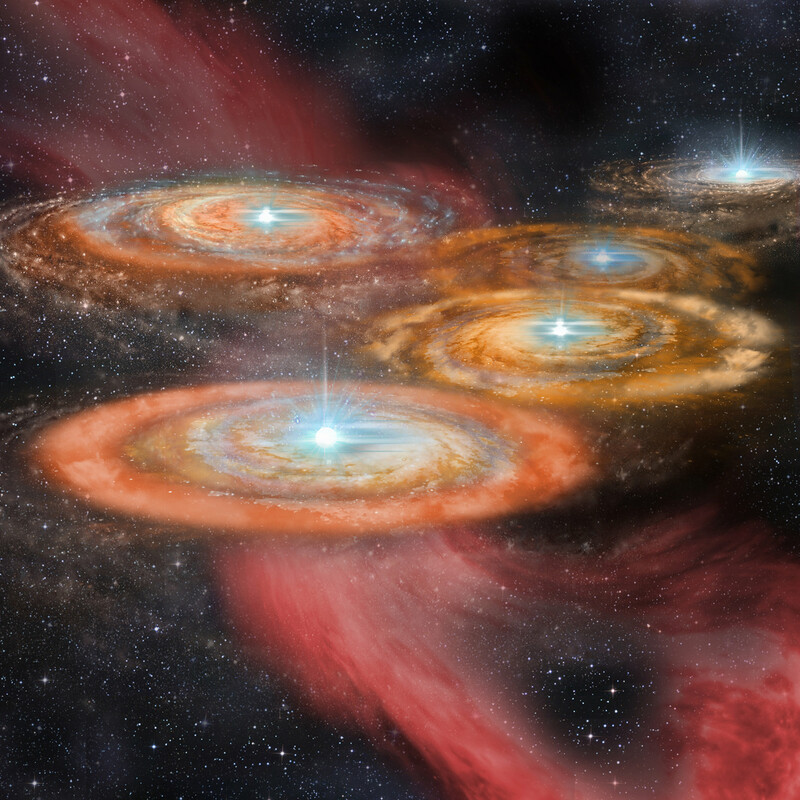 A newly published study analyzes the time evolution of the luminosity of a cluster of Population III protostars formed in the early universe, revealing that the first stars were as luminous as 100 million of our Suns. The first stars in the Universe were born several hundred million years after the Big Bang, ending a period known as the cosmological ‘dark ages’ – when atoms of hydrogen and helium had formed, but nothing shone in visible light. Now two Canadian researchers have calculated what these objects were like: they find that the first stars could have clustered together in phenomenally bright groups, with periods when they were as luminous as 100 million Suns. Alexander DeSouza and Shantanu Basu, both of the University of Western Ontario in Canada, publish their results in a paper in Monthly Notices of the Royal Astronomical Society. The two scientists modeled how the luminosity of the stars would have changed as they formed from the gravitational collapse of disks of gas. The early evolution turns out to be chaotic, with clumps of material forming and spiraling into the center of the disks, creating bursts of luminosity a hundred times brighter than average. These first stars would have been at their brightest when they were ‘protostars’, still forming and pulling in material. In a small cluster of even 10 to 20 protostars, the ongoing bursts would mean the cluster would spend large periods with enhanced brightness. According to the simulation, every so often a cluster of 16 protostars could see its luminosity increase by a factor of up to 1000, to an extraordinary 100 million times the brightness of the Sun. The earliest stars lived very short lives and produced the first heavy elements, like the carbon and oxygen that the chemistry of life depends upon. Light from these stars has traveled towards us for almost 13 billion years, so to observers on Earth they look very faint and also have their light stretched out into infrared wavelengths by the expansion of the universe. This makes these stars very hard to observe, but the next generation James Webb Space Telescope (JWST) will survey the skies to look for them. Although the luminosity of an individual first star is probably too faint for JWST to spot it, the new work suggests that clusters of the first protostars could be prominent beacons in the early universe. 4 Comments on "The First Stars of the Universe Were as Bright as 100 Million Suns"
I’ve wondered if smaller objects, too small to support fusion could still survive. They’d be almost pure hydrogen and helium with only traces of deuterium, helium 3, and lithium. As such they’d be much like a gas giant except without the colorful bands which contain methane and ammonia. They’d be very cold, what little heat of formation would have dissipated because such planets would lose quickly because of their hydrogen/helium composition. Any moons/planets they might have would also be gaseous. As such, they’d be extremely difficult to detect. Something to look for, however. So the universe already had a radius of 13 billion lightyears then? Taking into account the supposed accelerating expansion, how far are those stars away now? I think the word “observable” is missing in most articles. Like “The observable universe is 13 billion years old”. nice thinking quatra but it is not declared confidently by scientists that universe is very perfectly round(sphere) so we can’t say anything like radius.Keeping earth in center we can see 13 billion light years far object.But if we go 13 billion light years far who knows we can see lights of objects older than 13 billion years????? we can just tentatively about univerese we can’t declare anything.by quantum dot and quantum fluctuation anything can happen in very small duration of time.also it’s not final that univerese was created by big bang it’s just a very famous understandable theory by scientists!!!!!!!!!!!! !